I saw this meme on Facebook recently, which made me slightly wistful for the old days of the web … not the rubbish connection speeds or lack of content, but the pioneer spirit that meant the 404 page not found message was common. I will explain why there are fewer such unfriendly messages now, or at least there should be! First some background. The HTTP (Hyper Text Transfer Protocol) is one of the main reasons the world-wide web works, alongside other technologies such as TCP/IP, HTML and more recent XML and other formatting extensions. HTTP is a common set of rules and message standards (protocol) that allows links to be created between chunks of information on the web (pages, text, pictures, sound files etc.) and devices (other computers, printers) both in the same page or website, or a local network, or resources located physically anywhere in the world. 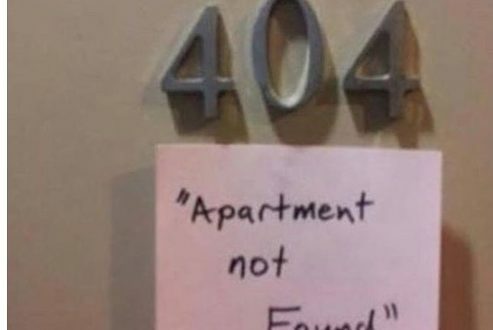 The standard 404 response code is part of the HTTP protocol, which basically says that you are trying to access a resource at an address that is incorrect, not found or broken link … the equivalent to snail mail ‘return to sender’. The client where the request comes from and the server where the resource should be located are at an impasse. You can easily simulate this on a website by making-up a page or subdomain and enter directly into your browser search box. For example I know that there is a ‘blog’ section in IT elementary school but not a ‘tuckshop’…yet! Luckily for me WordPress handles this error state so that I don’t have to create any bespoke program code. WordPress provides a reasonable message for the User, explaining what has gone wrong, offering a possible explanation, and points at resources that may be of interest on the website – a search box, a list of blog posts, word cloud etc. There are other HTTP standard response status codes, mostly relating to error conditions or unexpected situations; the ‘4xx’ class indicates a client error and ‘5xx’ a server error. However, there are also some informational and positive hand-shake type responses such as ‘200 OK’ – successful HTTP request. 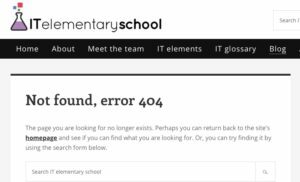 The above IT elementary school example could be classified as a user error. However, it is also possible that the website or application has got it wrong and the poor user has simply discovered a latent problem. Even the simplest website might have hundreds or thousands of links that need to be maintained to ensure internal integrity, but also links to external websites like wikipedia above, cannot be guaranteed to work in future. Hence the alternative name for a four-oh-four is a broken (or dead) link. Unlike the ‘raw’ program code which would take specialist programmers to investigate and resolve problems, websites normally have a Content Management System (CMS) where anyone* can create new pages (content) and organise the page structure (site map) in order to publish and maintain digital content quickly and efficiently. In an increasingly online world it is critical that organisations keep their digital shop window current, relevant and accurate, reducing the occurrence of 404 page not found messages where possible. As discussed in the IT element Testing software errors are a fact of life, and the more complex the man-made artefact the more likely that defects will exist and unexpected emergent behaviour may occur. 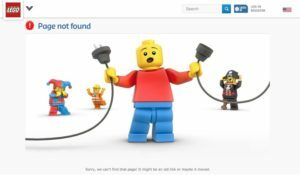 In recognition that not all problems can be predicted and prevented sometimes it’s better to use some humour and turn a potential negative into a positive, like this custom error page from Lego. So, if you didn’t recognise the meme at the start of this post, maybe it makes sense now – although it still may not be as funny as the prankster thought it was!